David Friedman blasts PA and terror groups for their response to terror attack yesterday in which Rabbi Itamar Ben Gal was murdered. 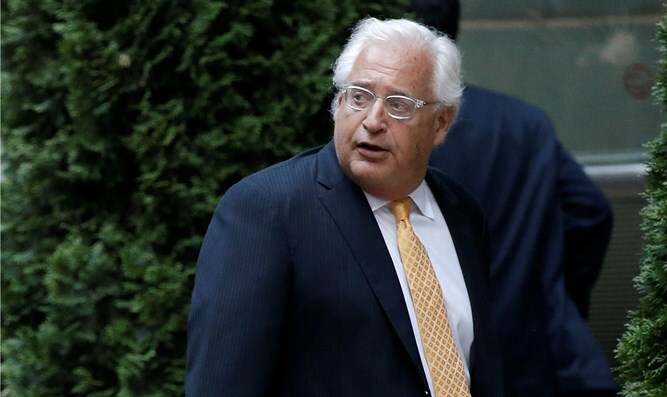 US Ambassador to Israel David Friedman condemned the Palestinian Authority and its conduct following the terror attack yesterday in the city of Ariel, during which Rabbi Itamar Ben Gal was stabbed to death. “20 years ago I gave an ambulance to Har Bracha hoping it would be used to deliver healthy babies. Instead, a man from Har Bracha was just murdered by a terrorist, leaving behind a wife and four children. Palestinian ‘leaders’ have praised the killer. Praying for the BenGal family,” the Ambassador wrote in a Tweet. The official Palestinian Arab news agency Wafa on Monday quoted Israeli media reports on the stabbing attack near Ariel in which Rabbi Itamar Ben Gal was murdered. The Wafa report, however, was not accompanied by any statement of condemnation of the attack from the Palestinian Authority or its representatives. Other terrorist organizations praised the murderous attack and the terrorist, whom police identified as an Israeli Arab citizen, who fled the scene and is being hunted by IDF forces.. In a statement issued by Hamas, the group said that the "heroic act" was carried out during the intifada and as part of the opposition to the American administration's decision to recognize Jerusalem as the capital of Israel. Hamas spokesman Abdel Latif Qanu called on the Palestinian Authority to sever all ties with Israel and allow the "forces of the resistance" to carry out serious attacks against the "occupation forces" and the “settlers”. The Islamic Jihad also praised the "heroic act" as "a natural response to the crimes of the occupation against the Palestinian people."